All-Surface Cleaning Machine: cleans and conditions carpet, stone, tile & grout, wood, vinyl, concrete, epoxy, and other surfaces. The Taz is the all-surface cleaning, scrubbing, sanding, polishing, extraction, interim, and grinding machine in the industry! It conquers carpet, stone, tile & grout, wood, vinyl, concrete, epoxy, and other surfaces. The Taz excels at chemical-free stripping, interim carpet encapsulation, tile & grout cleaning and more! Orb Technology is a superior orbital mechanics system. This system allows the Taz to outperform any other machine on the market. It also allows it to be more versatile and work on eight different floor surfaces. Orbital mechanics allow this machine to vibrate and rotate at the same time. This dual motion action sets this machine apart from the competition. CLEANING PATH: 17" - 21"
WEIGHT: 102 lbs. with WEIGHT KIT 142 lbs. 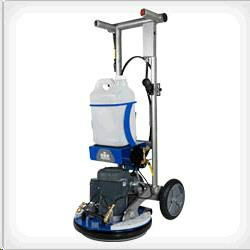 * Please call us with any questions about our taz orbital scrubber in Mason OH, Westchester OH and Cincinnati metro area.